How much protein should be consumed after strength exercise ? 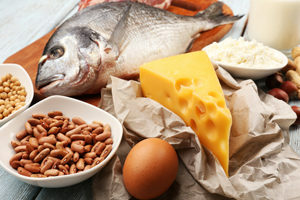 To maximally stimulate muscle building, research has shown that 20-25 g of high quality protein consisting of approximately 8-10 g of essential amino acids should be consumed after resistance exercise. Examples of high quality protein sources include lean beef, chicken, turkey, fish, whey protein, yogurt, kefir, fermented soy (i.e. tempeh), and eggs. Protein requirements decrease after a period of resistance training as the athlete becomes more efficient in utilizing protein. Hartman J. W., Moore D. R., & Phillips S. M. (2006). Resistance training reduces whole-body protein turnover and improves net protein retention in untrained young males. Applied Physiology, Nutrition, and Metabolism, 31(5), 557–564.